Showers likely and possibly a thunderstorm before 8am, then showers and thunderstorms likely after 8am. Mostly cloudy, with a high near 71. East wind 5 to 10 mph becoming west in the afternoon. Chance of precipitation is 70%. New rainfall amounts of less than a tenth of an inch, except higher amounts possible in thunderstorms. Showers and thunderstorms likely. Cloudy, with a high near 68. Northwest wind around 5 mph. Chance of precipitation is 70%. New rainfall amounts between a quarter and half of an inch possible. MUSKOGEE, Okla. – The Muskogee Public Schools Board of Education approved the hiring of the Sixth Grade Center Principal, Creek Elementary Principal, and Director of Accounting during the regular board meeting Tuesday evening. . . .
MUSKOGEE, Okla. – The Muskogee Public Schools Board of Education approved the hiring of the Sixth Grade Center Principal, Creek Elementary Principal, and Director of Accounting . . .
MUSKOGEE, Okla. – The Muskogee Public Schools Board of Education approved the hiring of the Sixth Grade Center Principal, Creek . . .
MUSKOGEE, Okla. – The Muskogee Public Schools Board of Education approved the 2019-2020 and 2020-2021 instructional calendars during their regularly scheduled meeting on Tuesday, April 16. The calendar approved by the . . .
MUSKOGEE, Okla. – The Muskogee Public Schools Board of Education approved the 2019-2020 and 2020-2021 instructional calendars during their regularly scheduled meeting on Tuesday, . . .
MUSKOGEE, Okla. – The Muskogee Public Schools Board of Education approved the 2019-2020 and 2020-2021 instructional calendars . . .
MUSKOGEE, Okla. – The Muskogee Public Schools Board of Education recognized the April Employees of the Month during its regular scheduled meeting Tuesday evening. Certified staff recognized were Anelicia Brimacomb a . . .
MUSKOGEE, Okla. – The Muskogee Public Schools Board of Education recognized the April Employees of the Month during its regular scheduled meeting Tuesday evening. . . .
MUSKOGEE, Okla. – The Muskogee Public Schools Board of Education recognized the April Employees of the Month during its regular . . .
MUSKOGEE, Okla. – The Oklahoma Hall of Fame announced recipients of the 2019 Oklahoma Scholarship Competition. Six Muskogee High School students were named recipients of the six scholarships available to students in Muskogee . . .
MUSKOGEE, Okla. – The Oklahoma Hall of Fame announced recipients of the 2019 Oklahoma Scholarship Competition. Six Muskogee High School students were named recipients of the six . . .
MUSKOGEE, Okla. – The Oklahoma Hall of Fame announced recipients of the 2019 Oklahoma Scholarship Competition. Six Muskogee High . . .
TAHLEQUAH, Okla. – Students from Muskogee High School, Alice Robertson Junior High School, and Sadler Arts Academy won numerous awards during the 2019 National History Day: Oklahoma Region Six competition on Tuesday inside the . . .
TAHLEQUAH, Okla. – Students from Muskogee High School, Alice Robertson Junior High School, and Sadler Arts Academy won numerous awards during the 2019 National History Day: . . .
TAHLEQUAH, Okla. – Students from Muskogee High School, Alice Robertson Junior High School, and Sadler Arts Academy won . . .
Enrollment for the Muskogee Early Childhood Center for the 2019-2020 School Year is now open. Click here to enroll now. Students must be four (4) years old on or before September 1, 2019. Documents needed for enrollment include . 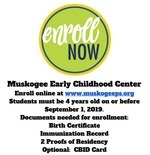 . .
Enrollment for the Muskogee Early Childhood Center for the 2019-2020 School Year is now open. Click here to enroll now. Students must be four (4) years old on or before September . . .
Enrollment for the Muskogee Early Childhood Center for the 2019-2020 School Year is now open. Click here to enroll now. Students . . .
MUSKOGEE, Okla. - Muskogee Public Schools’ Board of Education approved the hire of Lance Crawley as Chief Operations Officer for the district during the regular board meeting on March 12. “I am . . .
MUSKOGEE, Okla. - Muskogee Public Schools’ Board of Education approved the hire of Lance Crawley as Chief Operations Officer for the district during the regular board meeting on . . .
MUSKOGEE, Okla. - Muskogee Public Schools’ Board of Education approved the hire of Lance Crawley as Chief Operations Officer . . .